The problem is, that's a decorative light / accent light. It will probably grow something, but not sure how effectively. 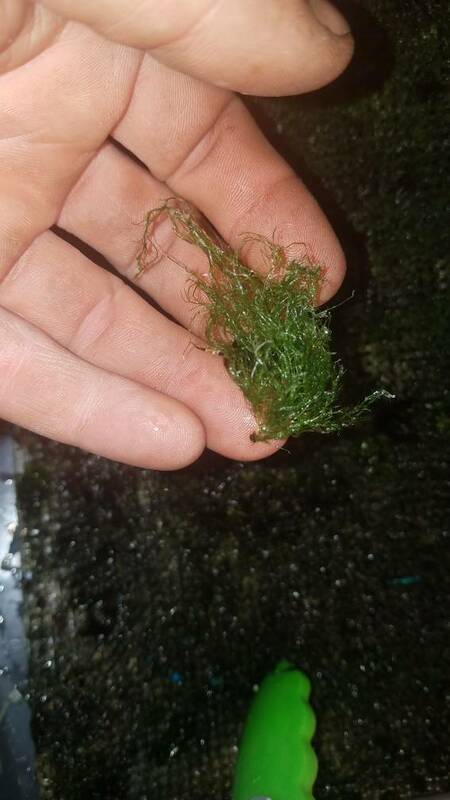 This post is just to say.. bryopsis on a scrubber grows like absolute mad!! I'm hoping it will consume all of its nutrients and die out soon..but in the meantime.. crossing my fingers that it stays on the screen!!! I don't see any bryopsis. Just cladophora. I've been running a box style ATS for about a year now. While I clean it weekly, I get about a cup of slimy green algae off it. it's never brown or do I have a bald spot on the screen, but it's never nice lush GHA like I see on most screens. Now I have 0 fish right now, and only feed my corals twice a week. 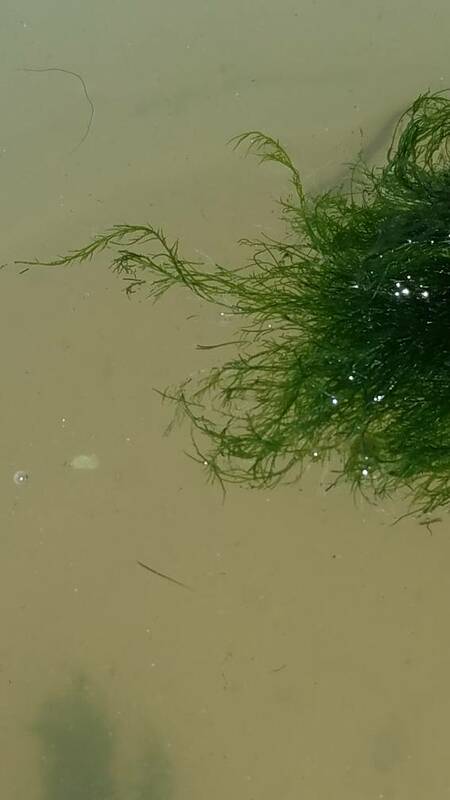 Is the algae this way only because of low nutrients? I have for months been testing super low nutrients, PO4(.004 - .010), and NO3 has always been 0. 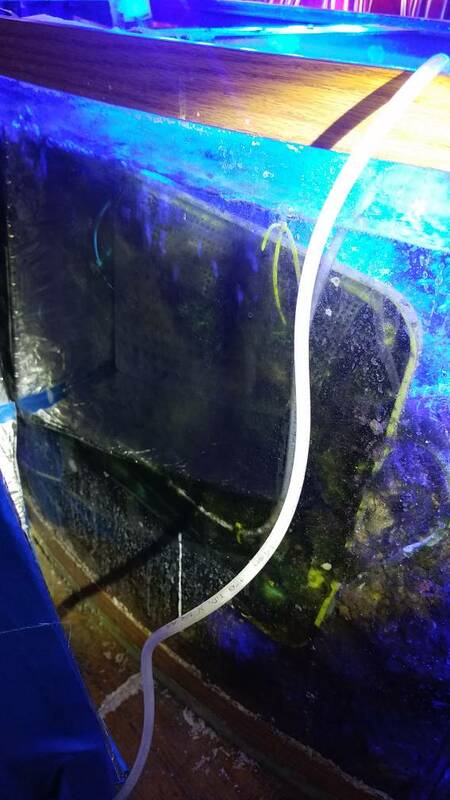 It does grow some algae and I have 0 in my display, just curious why the algae is slimy and not lush GHA like I see on most screens. There are a lot of factors that go into algae types and volume, so I think it's a bit difficult to say really. But my gut tells me that a lack of bio-diversity (i.e. no urea from fish) could be the reason. Corals are animals and do consume food and excrete waste, but not nearly to the level that a fish does. That, and your scrubber will generally grow in proportion to how much you feed...and if you over-drive it and starve it, you'll tend to get slimy growth. Yeah it grows, I have to clean it weekly, but it's just the slimy algae. Hours a day...hmm I have 2 20W spot light type lights(the pink photosynthesis kind) one on each side of the box/screen. Front light runs from 1pm to 12am, back light goes from 12am to 11am, basically 22 hours. I run them off my apex and can change the timing anyway I want. 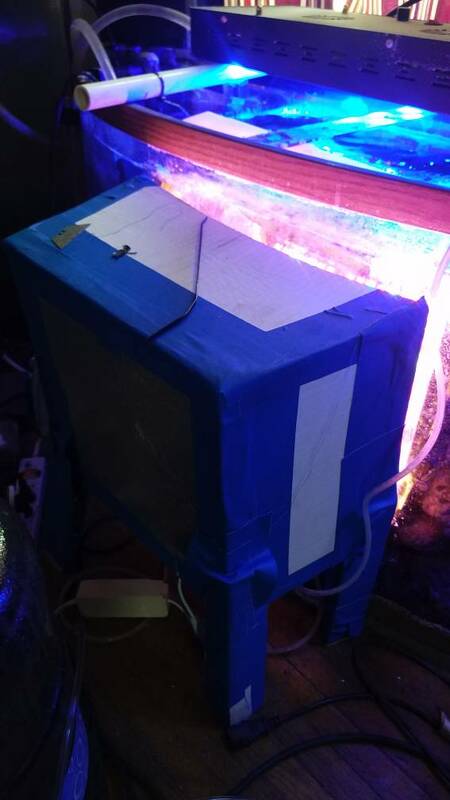 I tried a shorter photoperiod, but that just had 0 growth on the screen and some algae in the DT. Like I said though, my DT is algae free and for that I'm happy. Was just curious as to why I have just the slimy stuff and not nice lush GHA like I see on most screens. I had just assumed it was from a lack of nutrients(NO3 and PO4 are basically 0). Thanks for the help Floyd. Anyone ever go 8+ months never touching their screen? Ha! Most screens are not really lush... that's just what people post. But after feeding fish, it will thicken up. As for 8 months, yes many people leave their upflow scrubbers just running to feed the fish; they don't detach like waterfalls do. Haven't noticed anything major floating around so I assume anything that's in there is attached fairly well. But I have no idea what's in there right now. Haven't looked. Greetings, I currently have what I think is a successful closed-loop waterfall ATS currently running on my system but feel like I need more water flow. I am currently using the MJ900. Any advice regarding an upgraded pump that I can use to increase the water flow? When you say "closed loop" - what exactly do you mean? And of course, pics are worth more than anything! Could you please send me the guidelines for sizing a Waterfall ATS? Thank you so much! You have been so helpful. I currently have an ATS running and my tank is doing great. Need the formula because I am going to start a 150 gall. I didn't see information about LED lighting in the article. Problem rocks: Each 50 pounds (2.2 kg) of nuisance algae covered rocks you have adds 1 cube a day. Flow or air bubbles is always 24 hours; water flow is at least 35 gph per inch of width of screen [60 lph per cm], EVEN IF one sided or horizontal. FLOATING SURFACE SCRUBBERS WITH STRINGS: Screen size is the size of the box (Length X Width), and is 2-sided because the strings grow in 3D. Anyways.. I've got 2 questions.. I get a full screen of gha and bryopsis on my screen every week and I clean it off.. but the calderpa is showing nonsigns of slowing down...some has even taken root on my screen..
Any advice on how to combat this stuff? I manually pull as much as I can every week When I clean the scrubber.. I have also reduced my feedings as well.. though my large fox face didn't like that and ate my fav acan and a Duncan.. 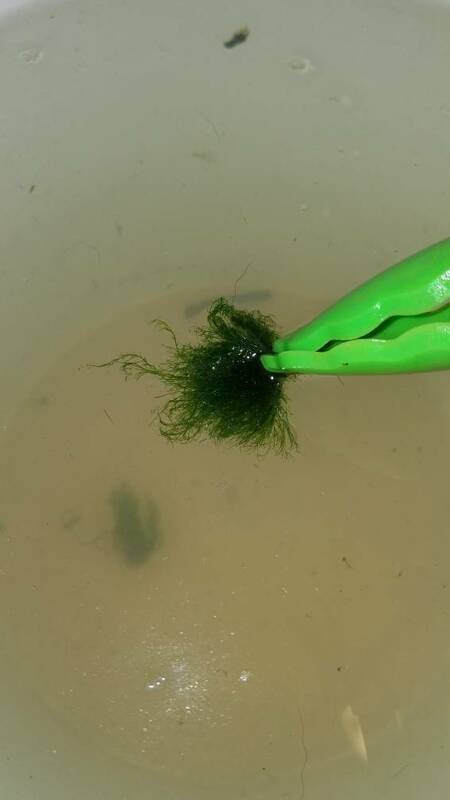 Question 2... my scrubber algae is packed full of these little ant like pods.. and tiny shrimp.. I've tried shaking them off in the display.. and in my second tank as well... but they hold on too tight..
How can I get the pods to let go... 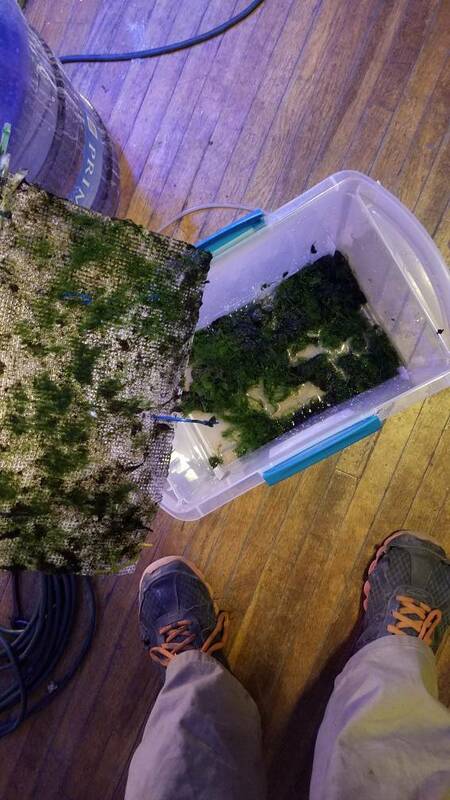 I though about setting a screen above my fuge or display.. and setting the algae on top.. in hopes that as it starts to dry.. they will abandon ship so to speak..and jump back into the water... Will that work?